Painting, to Marie Louise, comes closest to her other passions: Nature and Romanticism. What truly fascinates her, are the ambivalent (read: love/hate, tender/cruel) relationships between human beings and animals, adults and children, leaders and followers. In her paintings she tries to emphasize on taboos that often create cruelty and fear, abuse and loneliness. Starting point for her paintings are photographs from 19th Century landscapes, mainly set in North America, where pioneers conquered land, fighting and defeating nature. At first sight, they were building a new life, a new future, but Marie Louise wants to show the dark side of this experience.Without any respect for nature or the local population, these people were acting out of self preservation and their deeds were mainly fueled by self interest. Marie Louise wants to capture these dark aspects of mankind, expressed in meticulously painted works of art. She feels familiar to artists like P.J. Harvey, Marina Abramovic, Jerzy Kosinski, Ian McEwan, David Lynch and John Steinbeck, all of whom she admires for their force, their purity and their alienating abilities. Without concessions they show, each in his/her own way, neurotic and destructive powers that drive us, human beings, in this life. Marie Louise’s paintings are of an extreme beauty. Each time I look at them, I am divided between attraction and repulsion. One needs to be a very strong and determined artist in order to have the courage to mix feelings of aesthetics with those of claustrophobia and fear. Nature forgotten, secluded, inhabited by creatures, dwelling, aberrated,lost in solitude, alienated with their own rituals and secrets. In 2014 NOCTURNE artist collective received a commission by Museum Gouda to realize a site specific exhibition. Elshout created a so called Lebens Frieze based on the painting "Child on his death bed"
by the 17th century painter Bartholomeus van der Helst, a masterpiece in the collection of Museum Gouda. portrayed a fictional woman who loses her child, which we follow from birth to death. 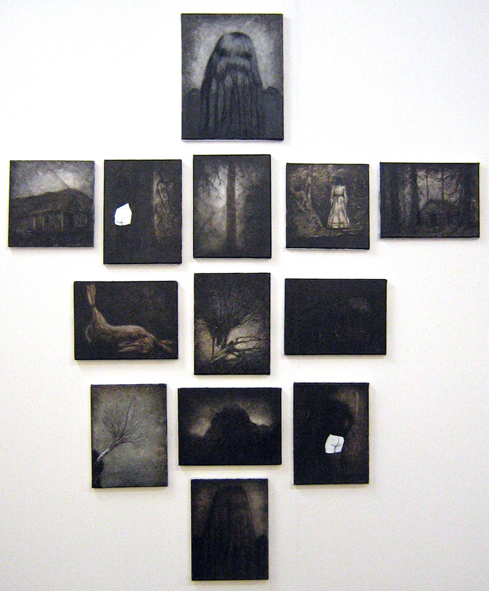 For the chapel Elshout realized ​​13 small Mary paitings portraying 13 metaphors to express her perception on religion. its permanent place is opposite the masterpiece of van der Helst himself. A series of paintings based on the 19th Century American Circus Side Shows, the so called " Freak Shows "
where those who deviate are somewhat isolated and exhibited. The title refers to an ancient spiritual ritual performed by Indian tribes in the US during the 19 th Centuary. For many " Native Americans " participating in the Ghost Dance was a way to put resistance against the white oppressor. It also stands for sharing collective grief and coping with difficult times of rapid and traumatic changes. The title Ghost Dance stands for shared grief but also refers to apparitions and a form of spectacle. prevailing rules or values ​​, or had the 'right' appearance.